Despite its age, the iPhone SE is still kicking, and Apple has even supported it with the latest release of iOS 12. If you’ve been enjoying your iPhone SE for a few years and want to keep enjoying, it’s a good idea to make sure it’s safe in a case. Luckily, plenty of cases have come out for the iPhone SE, and finding good ones is even easier because iPhone 5 and iPhone 5S cases will also fit the iPhone SE (just make sure they’re not for a Plus model). With a good iPhone SE case and proper care, you’ll be able to make sure your phone’s screen and body last as long as the battery does. You could even pick up a case that extends the battery. While some of these options are untested, they are each a cut above the rest due to their value and design, and are backed by positive consumer feedback. No case is likely to come close to looking as good as the iPhone SE itself does, which is why you might want to consider a sleeve instead, such as this one from Belk. With full body coverage it provides more protection than many cases when in use, but shows off your phone in full when you take the handset out. Of course, you also lose all of its protective qualities at that point, but it’s a safer option than not having a case at all. While there are any number of iPhone SE sleeves, the Belk Leather Sleeve stands out with an attractive synthetic leather finish, a magnetic flap to keep your iPhone securely in place, a pull tab to help you easily remove it and a few holes drilled to ensure you can still hear your phone when it rings. All that and it’s slim too. You don’t need real leather to get a leather look, and this Olixar case comes in a lot cheaper than similarly styled rivals, thanks to its use of faux-leather. It’s a convincing effect, and the wallet design means you also have slots for your cards and money, plus the case can be folded out into a stand for viewing media. The slim, lightweight design won’t add unnecessary bulk to your iPhone SE, and the overall appearance is almost as good as the far pricier (and real leather) Twelve South BookBook, found further down this list. Most cases are plastic, or if you spend a bit more leather, but even that seems a bit of a shame to use when your phone is metal. But there are options, including this case from Elago, which while not completely metal fuses aluminum and polycarbonate, to attractive effect. It’s a reasonably slim case too, and well thought out, with a camera cut-out that’s designed to ensure the camera and flash can be used without any interference from the case. It’s also available in a wide range of colors, so you can choose one to match or contrast your phone. If elegance and style are top priorities when accessorizing your iPhone SE, consider this cleanly milled, snug-fitting case from iCASEIT. The port cut-outs and button holes are beautifully precise, and the outside is only slightly rubberized to retain the slick look of the wood. Also, the use of natural grained wood as a cover for the snap-on polycarbonate shell ensures that no two cases are the same – the Rainbow option has a unique finish, too. At just 3mm thin, it lacks the ruggedness of, say, an OtterBox case, but the combination of materials ensures at least a fair level of durability. Even if you want a premium material you don’t have to spend a fortune, as the Ghostek Cloak case proves. Granted, the back is made of plastic, but there’s an aluminum bumper for a stylish and high-end finish, and the plastic part is transparent, so the metal of your iPhone SE can shine through. The design is fairly slim too and there’s a screen protector bundled with the case, so you can give your phone all-round protection. The great shame of cases is that they cover up a phone, that often, as in the iPhone SE’s case, has a premium design that you’d rather show off, but the Power Support Air Jacket does its best not to hide your device. The case is incredibly slim at just 1.2mm thick, and it’s totally transparent, making it almost invisible. In fact, viewed at a distance you might not even realize the iPhone SE is in a case at all. The downside to this minimalist design is that it doesn’t provide a huge amount of protection, but it should keep your phone safe from minor bumps and scratches. Tech21 has a proven track record when it comes to protective cases, thanks to the company's patented FlexShock system. The rubbery bumper on the Evo Mesh Case provides a solid defense against drops of up to 2 meters, yet the button covers are nice and flexible. The rubbery mesh back has plenty of grip and keeps the rear of your phone stylishly guarded but clearly visible, plus it steers well clear of the camera and flash. Best of all, the case remains slender and super-lightweight, so you won't even know it's there. The Carved Traveler series is a gorgeous selection of cases, made from real wood with artworks carved into them. 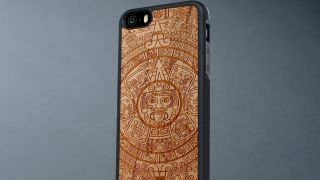 Both the material and the designs make them different to most other cases out there and they’re certainly eye-catching. The rubber frame detracts from the look a little, but it adds extra drop protection and makes it easier to firmly grip the case, and the phone it’s protecting. Don’t think your iPhone is colorful enough? It will be if you stick it in one of these cases. Speck’s CandyShell Inked case comes in three different designs, all of which are almost blindingly bright in color. They won’t be for everyone, but if any of the designs appeal and you want to stand out in a crowd this is the case for you. The case also offers a lot of protection, with shock absorbing and impact dispersing properties, which meet or exceed military drop test standards. This standard issue case from UAG boasts a soft rubberized screen bumper and rear skid pads for all-round protection from scratches and scuffs. The soft impact-resistant core is fused with a hard outer shell, offering decent structural integrity and a confident heft. Oversized tactile buttons lend the overall design a 'Robocop' feel, but generous port access and accurate button cut-outs keep things as low-profile as you can expect, and it's surprisingly lightweight, too. If protection is your first, last and only priority then you can’t do much better than the Griffin Survivor All-Terrain. This polycarbonate and silicone case is every bit as bulky as it looks in pictures, but it’s shatter-resistant, shock-absorbent, keeps dust and dirt out with hinged plugs, and of course it meets military drop test standards. The size means it won’t comfortably fit in smaller pockets, but that needn’t be a problem as it also comes with a detachable heavy-duty clip, to attach the phone to your bag or belt. Snakehive provide leather cases for your devices and its iPhone SE case is a great choice if you're after a premium feel on your phone. You've got lots of color choices with the iPhone SE case option and it has enough room for three credit cards as well as a slot for notes too. It's even embossed with the lovely looking Snakehive logo as well giving it a different look to anything else on this list. There are dozens of flip-cover cases on the market, but few of them can claim to feature a patented smart material designed to keep your phone protected from shocks. The molecules that make up the D3O material lock together on impact to absorb and disperse energy, before returning to their flexible state. Apart from the integrated D3O, the Oxford case can stand up your phone in landscape orientation for watching videos, plus there's a handy credit card slot in the inside screen cover, which also sports a firm magnetic closure. Most leather cases tend to imitate wallets, but if you want a more conventional snap-on case that doesn’t cover the screen, Apple itself has a stylish option in black, red or blue. As it’s made by Apple, you can be confident that this is a quality leather case, with a snug, slim fit. You can also be confident that your iPhone SE will be taken care of, thanks to a soft microfiber lining that helps protect it. Even so, this doesn’t offer as much protection as some alternatives, including the aforementioned wallet-style cases, but it’s slim, stylish and leaves the screen instantly accessible and the iPhone SE looking every bit as good as it does without a case. OtterBox is famed for its rugged smartphone cases and with good reason, as for years they’ve been keeping phones safe from scrapes and falls. Of its range, the Defender is perhaps the best, wrapping the iPhone SE in three layers of protection, including a two-piece internal shell, foam padding to cushion the handset, and a rubber slipcover to absorb the impact from drops and bumps. But it doesn’t stop there. The OtterBox Defender also has an integrated screen protector, port covers to defend against dust, and even a holster, which can be used to clip the phone to a belt or bag, or to prop it up, by acting as a kickstand. Battery life is one of the biggest problems faced by smartphones, and the Mophie Juice Pack Air aims to solve that, by building a battery into the case. It’s cleverly designed, with the iPhone always draining the case’s battery first, and with a switch allowing you to choose between charging and standby, plus a four-light LED status indicator to tell you how much battery is left. While somewhat chunky, the case is actually quite slim given that there’s a battery built in, and it promises to almost double the life of your phone. Pad & Quill has combined two daily essentials - iPhone and wallet - into a lovely hand-crafted wallet case that has space inside for multiple credit cards, ID's, and even cash. The wallet opens like a leather-bound book, revealing a birch wood frame that cradles the Apple smartphone via its grippy corners and provides decent protection from drops. The grain leather interior features four card/money pockets with precise stitching, while an elastic closure ribbon keeps the contents securely inside. A nice dual-layer case is a good way to enhance the durability of your iPhone SE. Spigen's Tough Armor case is just that, with a soft TPU layer that goes around the back and all four edges of the iPhone SE, and a hard polycarbonate section that wraps around the back. This gives you a lot better odds of dropping your phone without breaking the screen. See the Spigen Tough Armor case at Amazon here. If there's a popular phone, odds are good Otterbox has made a case for it, and it's no surprise that the company has several for the iPhone SE. The Commuter series is a simple two-part case, with a soft rubber inside and hard outer shell to defend your iPhone SE from all sorts of accidents. It even comes with a screen protector and one-year case warranty. See the Otterbox Commuter case on Amazon here. When will we see the iPhone SE 2, if ever?